Welcome to the I Love Me! Carnival! This post was written for inclusion in the I Love Me! 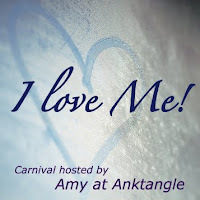 Carnival hosted by Amy at Anktangle. This carnival is all about love of self, challenging you to lift yourself up, just for being you. Please read to the bottom to find a list of submissions from the other carnival participants. I love you for your mind. till it reached the crown. the climax of the story. just the gift to unwrap. The Art of Being Thoughtful – Becky at Old New Legacy likes that she is mostly thoughtful but wants to become more thoughtful. She shares a story that demonstrates that giving gifts doesn't have to be expensive. I love me (and running)! – Sheryl of Little Snowflakes writes about her new love of running and how it has helped her learn to love herself! For the Love of Moe – Valerie at Momma in Progress shares her thoughts on a body forever changed, but forever loved. Where I Find My Worth – Sarah at Parenting God's Children shares how finding her worth in worldly things always falls short. Oh Yeah, I'm Cool – Tree at Mom Grooves shares her very favorite gift and the thing she most wants to pass on to her daughter. Loving – Rosemary at Rosmarinus Officinalis talks about some of the things she loves about herself - some easily, and some by choice for the sake of healing. caught in a landslide – jaqbuncad of wakey wakey, eggs and bakey! shares a list of reasons why zie loves hir body. I Love Me! - A Rampage of Appreciation! – Terri at Child of the Nature Isle stops waiting for anyone else to tell her she is wonderful and goes on a rampage of appreciation for herself! Raising Healthy Daughters – In a guest post at Natural Parents Network, Kate Wicker offers tips to pass on a healthy self-image to the young ladies in our care. Unexpected Benefits of a Healthy Pregnancy – How does it feel to have a healthy pregnancy? Dionna at Code Name: Mama discovers that making positive choices can be empowering. Filling Up Our Watering Cans – Nada at miniMOMist believes that practicing Sabbath is the same as being a gardener who lovingly tends to the flowers in her garden. She needs to fill up her watering can first. Better Body by Baby – Jess from Mama 'Roo and Family Too! shares how having her first baby makes her feel even more beautiful and confident about her body than ever before. These Breasts Were Made for Nursing – Becoming a mother helped Mandy from Living Peacefully with Children to embrace her womanhood and improve her self image. Yeah, I'm Pretty Cool – Amanda at Let's Take the Metro writes about her own self love and how she hopes to foster the same self-respect in her children. Who I've Become – The future is bright with That Mama Gretchen who shares her past and present perspective on body image and how she hopes to become a change agent with her daughter. Ever-Evolving Me – Joella at Fine and Fair writes to her daughter about her innate drive to continue learning, growing, and evolving. I love you for your mind – Lauren at Hobo Mama turns a dubious phrase on its head with a little self-loving slam poetry. Stop Think of Love with Your Body – Amy of Peace 4 Parents shares an exercise to gradually transition from hating to loving your body - stretch marks, sags, imperfections, and all. I Love Me! – Jenny @ I'm a full-time mummy shares the things that she loves about herself! First, I'm Superwoman. Later, I'm Supperwoman – Patti @ Jazzy Mama explains how she loves taking care of her amazing body. It birthed 4 children, after all! Baby Strikes A Pose – Emma from Your Fonder Heart writes about her family's decision not to let their 7 month old model, and uses the opportunity to think more deeply about girls (young and old) and how they determine their self-worth. Love Your Tree – How do you picture the ways your body and mind change? Amy at Anktangle writes about how trees help her have perspective about her own growth over time. I do love me – Shannon at Pineapples & Artichokes talks about the lessons about loving herself she wants to pass along to her daughter. Appreciating Who I Am – Linni at An Unschooling Adventure describes the things she likes about herself and the way she appreciates who she is as a person. I love me! : A journey – Christine at African Babies Don't Cry shares her journey on arriving at the point where she can say: I love me! My Daughter Doesn't Care So Why Should I? – Jennifer at Hybrid Rasta Mama calls herself on the carpet for the image of self love and beauty she portrays in front of her toddler. Finding out who I am – Melissa at Vibrant Wanderings shares an exercise that helped her identify positive qualities she possesses, and how that has helped her learn to love herself. I love the rhythm of this poem - so beautiful! I would love that mind too! This poem is a great model for any woman to live her life, searching for truth. I always grew up hearing that the mind lasts longer than a hot body, but honestly I would rather, hands down, have a mind so superb! Who wouldn't want to be a "fun and witty,/coy and flirty,/scheming machine."?! I love your writing! I absolutely love this, Lauren! Such a fantastic poem! Wonderful!! I have no words to add to what you already wrote. Simply beautiful! Very cool poem... really great. Just checking on the hobomama lol, I stop by and read your blog every now and then. 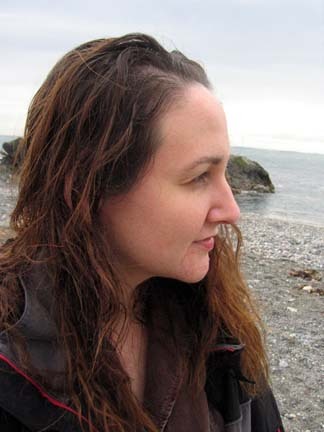 Lauren, I do love YOU for your mind - and your poetry, your musical words, your empathy, your insight, and your beauty. Thanks for sharing your mind and heart with us. What a brilliant poem! It's so creative and different. I love it! Wow! You are truly such a talented poet and have a wonderful way with words. We all do really want to be loved for our minds, for our thoughts, our hopes, our dreams, our bravery and actions! Completely Awesome!!! And what fun to get to read a beautiful poem (especially as it is the last one I can manage tonight). I will read this again. It made me want to sway with it. Beautiful! I would love to hear you read this - have you thought about making an audio book too? Thank-you for being you - I have learned and enjoyed so much that came forth from your mind! Onelove. Wow - this is really lovely. Thanks so much for sharing, I loved reading it.